Drombeg Stone Circle is the best known archeological site in West Cork. Before it was excavated by Professor Edward Fahy in 1957, it was known locally as the Druid’s Altar. Professor Fahy found fourteen standing stones forming a circle, the diameter of which is 9.3 meters approximately. Three fallen stone were discovered and reinstated bringing the total to seventeen. The majority of the stones are of local sandstone. Within the circle, there was a graveled floor consisting of pebbles and flakes of slatey rock closely compacted. Beneath the floor, fire pits were found, in one of which was a broken pot containing some cremated human bone. On the upper surface of the axial stone, the largest stone in the circle, are two shallow cup-marks, one surrounded by oval carving. 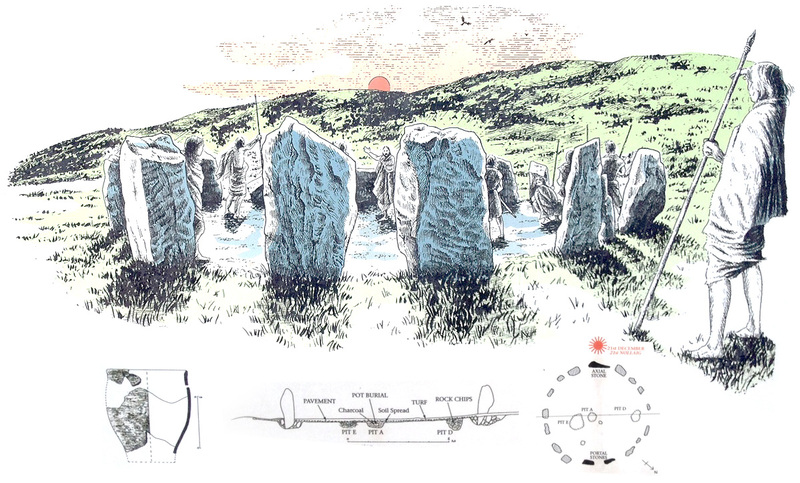 The circle is orientated so that the main axis of the circle (a line extending from the middle of the gap between the entrance portal stones to the centre of the axial stone) is aligned north-east/south-west so that the sun setting on the evening of the winter solstice shines directly on to the axial stone. Drombeg and the other forty or so stone circles in West Cork were ritual sites where ceremonies took place. West of the stone circle are the ruins of the oval huts made of standing stones. South of the hut is a fulacht fiadh or cooking pit. The fulacht fiadh is oval, marked by a bank of boulders, surrounding a stone-lined cooking pit, a hearth and a well. Heated stones were used to boil water for cooking. Professor Fahy conducted experiments to measure the efficiency of hot stones in boiling water. Seventy gallons of water were put into the trough and it was brought to the boil in eighteen minutes. Carbon dating done in the 1980s established the date of the circle to be in the 11th century B.C.